Believe it or not, nutrient deficiencies can lead to hair loss in women, which is why adequate nutrition is so important to maintain luscious locks. Knowing key nutrients important for healthy hair, and how much of each to consume daily, is crucial for preventing this type of hair loss. Getting too little vitamin is one cause of hair loss, according to a 2010 study published in the Journal of Oncology Practice. While researchers don't say why exactly vitamin D deficiency is associated with thinning hair, vitamin D supplementation can help correct the problem. Ways to prevent hair loss associated with vitamin D deficiency are eating plenty of vitamin D-rich foods, getting 15 minutes of sunlight three days weekly, and taking a vitamin D supplement containing the recommended dietary allowance (RDA) for vitamin D - which is 15 to 20 micrograms daily for adults. Iron is one of the more common nutrient deficiencies in the U.S., especially among women. 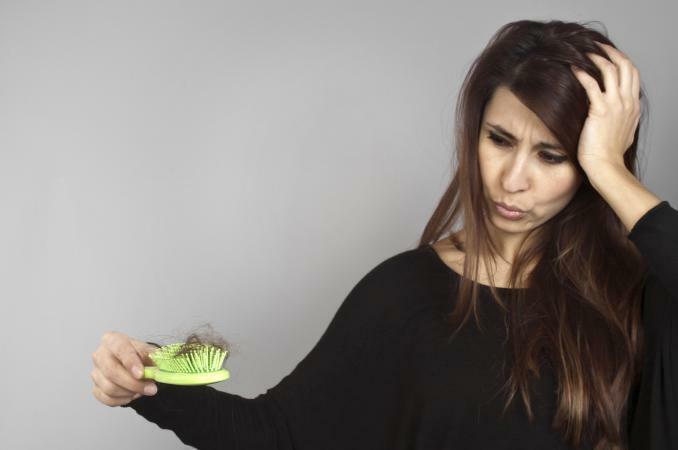 The Journal of Korean Medical Science found that while iron's role in hair loss isn't entirely clear, it does appear that getting plenty of iron may help prevent female pattern hair loss, especially in premenopausal women. That's why getting plenty of iron-rich foods is important, and meeting iron RDAs (18 milligrams for women ages 19 to 50, 8 milligrams for women over age 50, 27 milligrams for pregnant women, and 9 milligrams for nursing women) is necessary to maintain healthy locks. While not a vitamin or mineral, protein is a nutrient that's crucial for hair loss prevention, according to the American Academy of Dermatology. Hair is made up of protein, which is why this nutrient plays such a key role in healthy hair maintenance. Protein RDAs, which should be treated as minimum daily protein requirements, are 46 grams for women, 56 grams for men, and 71 grams daily during pregnancy and breastfeeding. Be sure to eat plenty of protein-rich foods regularly to meet these dietary needs. Getting plenty of fats (especially omega-3s) in your diet daily keeps your scalp and hair hydrated, which preserves the integrity of hair bulbs, according to a 2016 study in Menopause Reviews. Authors of the review say that getting plenty of these healthy fats in your diet - like walnuts, flaxseeds, flaxseed oil, walnut oil, pumpkin seeds, pumpkin seed oil, canola oil, soybean oil, and fish - are a must for healthy-looking hair. Adequate intake levels for omega-3 fatty acid ALA (alpha-linolenic acid) are 1.1 grams for women, 1.4 grams during pregnancy, and 1.3 grams when breastfeeding. The mineral zinc is also a must when you want to maintain luscious locks. A 2013 study in Annals of Dermatology found that zinc blood levels are much lower in patients suffering from hair loss, and disturbances in zinc metabolism appears to play a role in thinning hair. So, eat plenty of zinc-rich foods and look for multivitamin supplements containing this essential mineral. Zinc RDAs are 11 milligrams for men, 8 milligrams for women, 11 milligrams during pregnancy, and 12 milligrams for breastfeeding women. Be sure to eat plenty of vitamin B-rich foods, and look for multivitamins containing RDAs for essential B vitamins including thiamin (B1), riboflavin (B2), niacin (B3), pantothenic acid (B5), vitamin B6, biotin (B7), vitamin B12, and folic acid. Because vitamin C is an antioxidant, it likely helps keep hair intact. Vitamin C appears to prevent oxidative damage associated with aging that can decrease hair production, according to the 2009 study in the International Journal of Trichology. Vitamin C also increases iron absorption in your body, which is crucial for healthy hair maintenance. Get plenty of vitamin C-rich foods in your diet and be sure to meet your body's vitamin C RDA (90 milligrams for men, 75 milligrams for women, 85 milligrams during pregnancy, and 120 milligrams for breastfeeding women). As with vitamin C, vitamin E is an antioxidant that protects your hair from free radical damage, based on the 2009 review in the International Journal of Trichology. Plus, many vitamin E-rich foods, like nuts, seeds, and oils, are also rich in fats that are crucial for maintaining a healthy mane. A 2010 study in Tropical Life Sciences Research found supplementing with vitamin E increased hair growth in 21 volunteers suffering from hair loss. Aim to consume at least the vitamin E RDA, which is 15 milligrams per day for adults (19 milligrams for breastfeeding women) daily. Vitamin A plays a role in hair hydration, protecting and strengthening your locks. Vitamin A deficiency may decrease hair cell regeneration and growth, according to the 2016 review in Menopause Review. 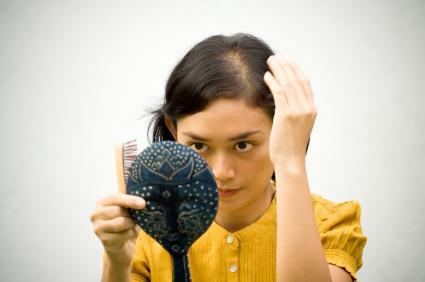 However, too much vitamin A from supplements can also lead to hair loss. So, eat vitamin A-rich foods but avoid taking supplements in doses that exceed the vitamin A tolerable upper intake level (3,000 micrograms daily for adults). Selenium is another important nutrient when you want your mane to shine. A 2011 study published in the International Journal of Trichology found that low selenium levels are associated with brittle hair, hair loss, and hair color changes, and selenium supplementation helps improve thinning hair. Aim to consume at least 55 micrograms of selenium daily, which is the RDA, and eat plenty of selenium-rich foods when possible. Getting plenty of essential vitamins, minerals, protein, and healthy fats in daily is crucial for preventing hair loss in women. Proper, gentle hair care and avoiding certain medications, smoking, and unprotected sun exposure to the scalp are other ways to lower your chance of thinning hair.